From picking the right flowers to decorating your garden shed, here’s everything you need to know to create a beautiful backyard. 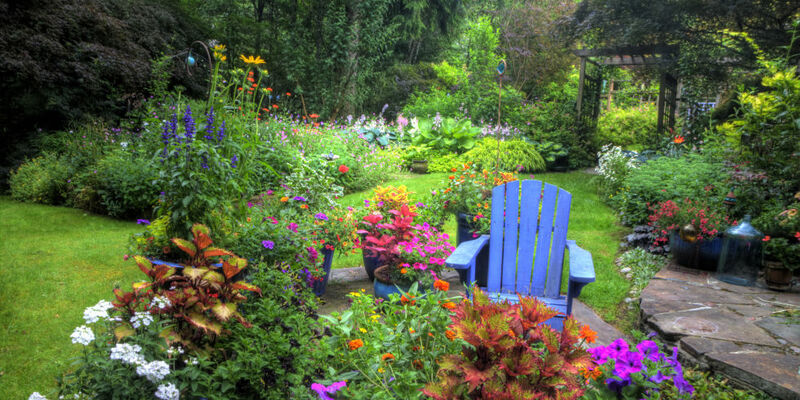 Click on link below to see 50 different gardening tips for your yard. You’ve heard that when it comes to looks, age is just a number – but does the same go for your house? We think so! The best part about giving your house a facelift is that you don’t need to go all “Botox crazy” on it to bring back that youthful glow. All you need to do is give a little TLC to the exterior. Your front door is literally the gateway to your home, so dress it up. First, repair and replaceany old or tarnished door hardware. Then clean off any dirt from the door’s exterior and add a fresh layer of paint. Your door will appreciate the royal treatment. For people, old age brings wisdom and experience. Not so much when it comes to exterior paint. Ignoring worn-out paint exposes your siding to the elements, which can cause warping and sun or water damage. Take a walk around the house and look for chipping, flaking or peeling paint. If you see any, do a quick touch up with your home’s original paint colors. This is one of the best things you can do to give your home a fresh face. Taking a little time to trim and prune your trees and hedges is a lot like giving your house a hip, new haircut! Plus, it prevents damage to existing plants and encourages healthy growth for future foliage. Have you ever heard that a beautiful face is often defined by symmetrical features? The same goes for your front porch! Try adding a few potted plants or outdoor accents to both sides of your doorway. Also, make note of the color combinations you’re choosing for wreaths, doormats and outdoor light fixtures. 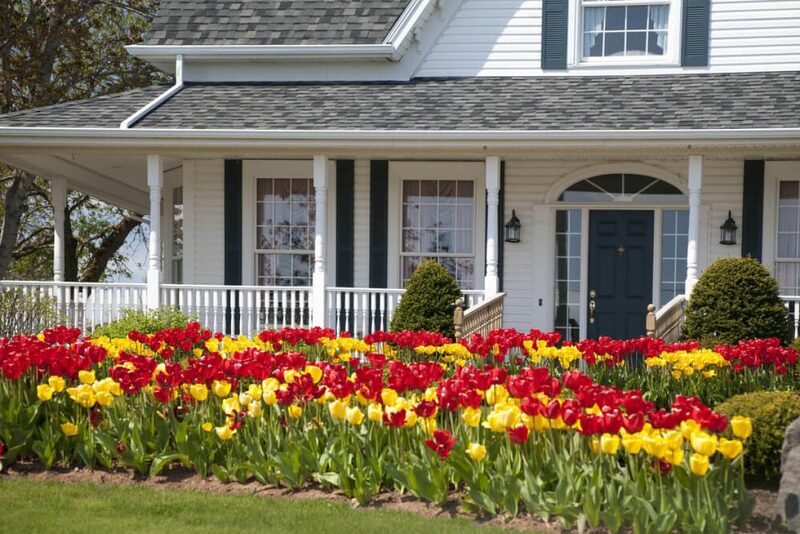 The colors you decorate with should all work together in upping your curb appeal ante. Besides the front door, your walkway and driveway are the first things guests will see when they visit. Grab a bristled broom and do a quick sweep of any dirt, debris or pollen that has settled on your stepping stones. If you have a few nasty blemishes on your driveway from oil and grease stains, they can be cleaned up with cat litter and laundry detergent. Whether you’re downsizing to a smaller home or finally tackling those closets, a yard sale is the perfect place to offload your clutter. You’ll not only get rid of unwanted clothes, books, and toys, you’ll also make some cool cash in the process. To maximize how fast your castoffs fly off your lawn, here’s some advice on how to run a successful yard sale. Craigslist may be a go-to, but you should check out some different sites to spread the news, including GarageSaleHunter, YardSaleSearch, and GarageSaleFinder. As a reminder, repost your sale a week ahead and the day before. Going the old-fashioned sign route? It pays to invest in a sturdy oak tag rather than lightweight construction paper for your sale signs—they’ll stand up better to the elements (wind, drizzle). But don’t post them to telephone poles or trees, as some city ordinances prohibit signage without a permit, warns Chris Heiska, creator of YardSaleQueen.com, in Lusby, MD. Instead, attach signs to wooden stakes and poke them into the ground the day before or early in the morning of the event. You need money to make money! Gather plenty of singles, five-dollar bills, and quarters—and don’t forget a calculator. If you’re selling big-ticket items like lawn equipment or sporting goods, have some larger bills on hand, too. Set up your till in an old lunch box, or wear an apron with a deep front pocket. Be ready to start selling on time—or even early. If your sale is slated to begin at 9 a.m., you might get a few early birds at 8:30 a.m., hoping for first pick. Got a weed whacker, almost-new bike, or a full set of patio furniture? Place it right up front, either at the end of your driveway or on the lawn’s edge. This way, passers-by can easily see these larger things and may decide to pull over. Then set up the rest of your wares in an organized fashion. Arrange dishes and small items on folding tables, line up books with spines in the same direction, and hang clothes on a collapsible coat rack or clothesline strung between two trees. “For example, a table with books can have one sign that says hardcovers $1, paperbacks 50 cents,” she says. 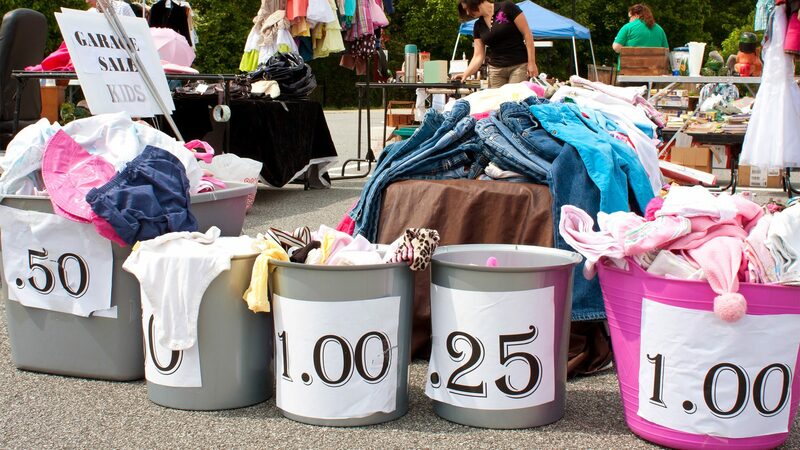 Clothes can go for $1 per piece, and so on. Everything needs a price, however, so that you don’t end up fielding questions all day. But how much should you charge? Typically, items sold at garage and yard sales are set at a third up to a half of the price you paid for it new. You can also price items by the bundle (3 for $1, say) in order to get rid of multiples in one fell swoop. You want the stuff to disappear, so be reasonable when it comes to lowering prices. If you’re asking $5 and the offer is $3, it’s easy to say $4 and be done with it. Of course, there are times to stick to your guns. For example, if you know your practically new wheelbarrow is $65 at Home Depot, don’t be swayed by hagglers trying to offer you less when you’re already giving them a deal. It’s not a cocktail party, but if it’s a nice warm day, a cooler of sodas or water is a nice touch. At $1 a can, you might make a small profit on the beverages and you’ll entice people to hang around a little longer. And if your kids are in the right age range, let them sell cookies or brownies alongside the drinks. Putting out a trash can is a good idea, too, for cups, napkins, and other debris that tend to collect around sales. Remember, you don’t want to haul any of your stuff back into the house, so think about filling a big box labeled “free.” (We’re looking at you, mountain of stuffed animals—the same goes for those stacks of romance novels and piles of CDs.) Or spur sales by creating a “gift with purchase” table, suggests Novak. “For every $25 spent, let the buyer pick an item for free, or wrap some up as ‘surprise gifts’ with purchase and let the buyer choose one,” Novak says. And as with the early birds you’ll have before your sale, you can probably expect folks toward the end of the event looking for last-minute bargains. Be prepared for this by slashing prices in the last hour or two. The U.S. Army also celebrates its birthday today. The Flag Day holiday traces its roots to 1885, when Bernard J. Cigrand, a school teacher at Stony Hill School in Waubeka, Wisconsin, held the first unofficial observance for the American banner at his school. Cigrand went on to deliver speeches around the country about patriotism and the flag and later became president of the American Flag Day Association and the National Flag Day Society. President Woodrow Wilson signed the first national proclamation designating June 14, 1916 as National Flag Day. President Calvin Coolidge did the same in 1927 but it wasn’t until 1949 that it was officially signed into law by President Harry Truman. On June 14, 1937 Pennsylvania became the first state to celebrate Flag Day as a state holiday. Flag Day is not a federal holiday, however and businesses and government offices remain open. The week of June 14 is designated as National Flag Week and people are urged to fly the American flag throughout the week. There are also parades and other celebrations, including ceremonies at Waubeka, Wisconsin where a bust of Cigrand stands today. Display the U.S. flag from sunrise to sunset on buildings and stationary flagstaffs in the open. If displayed at night the flag should be property illuminated. The U.S. Flag should be placed above all others if multiple flags are on the same staff. Don’t miss out on this well maintained and cared for home. Location home is located in the heart of University Pl and UP schools.Close to Whole Foods & Trader Joe, restaurants, Chambers Bay golf course. Home features: 4 Beds, 2 full baths, 2168 sq feet w/ hardwood and tile flooring and carpet throughout, granite slab counter tops in kitchen and tile granite in bathrooms.Large family room. Large backyard & garden space and a shed. Oversize tandem 1 car garage drive in & drive out to yr backyard. Feel free to call Leslie Swindahl @ 253-312-0447 for a free showing. Turn on my Smart Home! The Coldwell Banker team attended a presentation by Amazon to learn more about the latest in home automation – your voice. Through Amazon’s Alexa-enabled products, controlling your home is as easy as ‘Hello, Alexa’. Have you met Alexa? She is a voice activated cloud service that lives inside theAmazon Echo and she’s here to help you control your smart home. 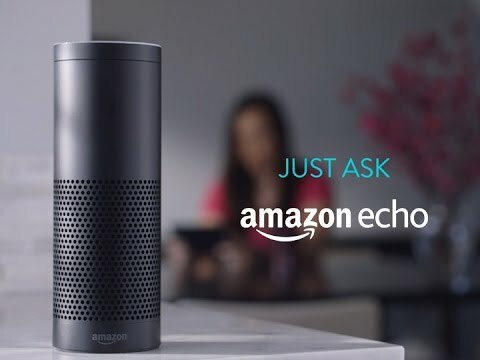 Through Alexa the Amazon Echo, Amazon Dot and Amazon Tap can control everything from your music, to your lights to the temperature in your smart home – all without you having to move off the couch. She’s completely controlled by voice, and does exactly what you’ve asked, unlike some of the other people who live in your house! You can see exactly what Alexa can do here. The devices fit right in to your home. They are sleek and require no wires or installation. All you need is an internet connection and you can customize Alexa to work with a number of apps. Alexa can play music on Spotify, read you the latest news on NPR News app, and she’s even connected to your Amazon account. In the laundry room and realize you’re out of detergent? Don’t fret, just tell Alexa and she’ll make sure your favorite brand is delivered to your door. Alexa is also compatible with smart home apps that control components of your home such as Phillips Hue, wemo and Samsung SmartThings, to name a few. But that’s not even the most exciting thing about Alexa. Her best characteristic is that she’s a quick learner! The technology is very intuitive – Alexa is learning new skills at quite an impressive pace. Last month, the Coldwell Banker team attended a special presentation from Amazon about the future of Alexa. The Amazon skills platform is now open to all sorts of companies, meaning that Alexa will be able to do even more, even sooner. A skill could be anything from requesting an Uber to ordering a pizza or changing the color of the lighting in your room, all without you lifting a finger – all you need to do is ask Alexa! Senior Manager, Public Relations for Coldwell Banker Real Estate LLC. Grew up in south Florida as an avid Seminole fan and attended college in the mountains of North Carolina. Athena wanted to wake up in that city that doesn’t sleep so headed Madison Avenue to start her marketing career. Athena has worked for Coldwell Banker for 13 years where she can be found generating buzz about this awesome brand in every way possible. On any given day, she can be found crunching numbers to searching for amazing Coldwell Banker properties to serve up to the media for features. In her spare time, you can find her either digging up a new area in her yard for another flower bed or scouring Etsy for that next amazing handcrafted gem. She resides with the Bukowski of our generation (AKA her husband), two cats and a fish in Atlanta, Ga.
Coldwell Banker Bain | Seal has been named a top brokerage firm in the 2016 REAL Trends 500, an annual research report which identifies the country’s largest and most successful residential firms as ranked by closed transaction sides and separately by closed sales volume. Coldwell Banker Bain | Seal ranked #14 for sales volume in the survey, reporting $6,004,672,189 in closed sales in 2015. The company also ranked #29 in closed transaction sides with 13,069 reported. The REAL Trends 500, now in its 29th year, remains the undisputed leading report ranking the performance of the top residential real estate brokerage firms. Firms are ranked by both transaction sides and sales volume. Due to the requirement that all information be independently verified, the REAL Trends 500 remains the trusted source for information about the performance of these firms. For the 2016 REAL Trends Survey, firms needed to close a minimum of 1,702 transaction sides in 2015 to place in the top 500. The Pending Home Sales Index, a forward-looking indicator based on contract signings, hiked up 5.1% to 116.3 in April from an upwardly revised 110.7 in March and is now 4.6% above April 2015 (111.2).After last month’s gain, the index has now increased year-over-year for 20 consecutive months.